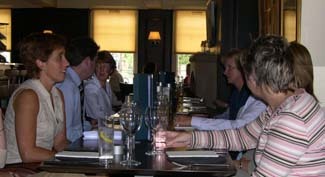 The Plough Inn: Mon to Wed 11.30am–11pm; Thu 11.30am–12am; Fri & Sat 11.30am–1am; Sun 12pm–11am Simply Seafood: Seats 40. Thu-Sat 6–9.30pm. 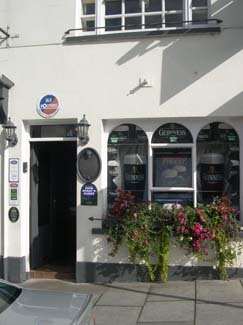 Toilets wheelchair accessible; children welcome (high chair, childrens menu, baby changing facilities). Sun terrace. Parking. Closed 25 Dec. Amex, Diners, MasterCard, Visa. Established in 1752, this former coaching inn is owned by the Patterson family - brothers William, Richard and Derek Patterson - who have built up a national reputation for hospitality and good food, especially seafood. Somehow they manage to run several separate food operations successfully each day, including a family-friendly café, a dedicated seafood restaurant and a stylish bistro above the pub, so pleasing customers looking for a casual daytime meal and more serious evening diners. Most of the pub is now stylishly contemporary, but in the main building there’s a characterful old bar, where fairly traditional bar food is available, and a stylish bistro above the old bar that overlooks the square that offers an interesting menu in the evening as well as a good-value Sunday lunch. The Plough is renowned for fine steaks and seafood – the latter to the extent that they launched a dedicated 40-seater Simply Seafood restaurant in 2012, with seafood sourced from Northern Ireland’s fishermen and a couple of ‘butcher’s block’ options to keep the carnivores happy or a surf ’n’ turf option for the best of both worlds. While there is obvious youth appeal, people of all ages feel comfortable here and the staff, who are clearly proud of it, are friendly and very helpful. Children are well looked after too – the usual options like chicken goujons, burgers or fish fingers are homemade and tasty enough to have the adults eyeing up the kids’ plates greedily. Craft beers and cider are available in the pub and bistro, even though they aren’t listed on the drinks menu, so be sure to ask what they have available in bottle or on draught. In the adjacent building, you will find The Vintage Rooms, which replace the former Barretro Café. 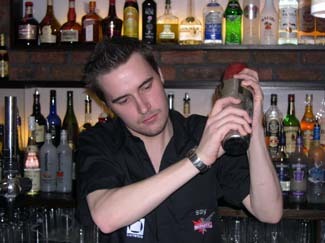 Hillsborough's only lounge bar experience, the Vintage Rooms include a Gin Bar, spirit and wine library and whiskey cellar and - a uniquely club-like offering - customers have the option to buy their drinks by-the-bottle, and are provided with an exclusive locker to stow their personally labelled spirits until their next visit. Also, as well as a sit down lunch and evening food on Fridays and Saturdays, there's a takeaway option available for most of the day. The Plough Inn is extensive and constantly changing, so allow yourself time to have a good look around and get your bearings before settling down to eat. [The Plough Inn was our Pub of the Year in 2004]. 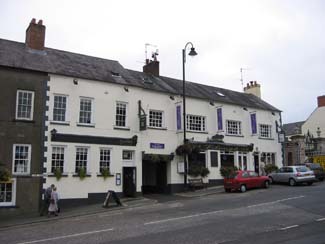 *The Pheasant Inn at Annahilt is a sister establishment (see entry) as is The Tannery in Moira. Off the main Dublin-Belfast road, turn off at Hillsborough roundabout; in village square.